Schick Razors As Low As $.85 At Walgreens! Walgreens has select Edge, Schick or Skintimate Shave items on sale buy on get one 50% off, plus you'll get 5,000 Balance Reward Points for purchasing $20 worth! There is also a Booster Points coupon in this week's Walgreens add for an extra 10,000 Balance Reward Points when we spend $30 through … [Read more...] about Schick Razors As Low As $.85 At Walgreens! Zest Fruitboost Shower Gel Only $1.22 At Walgreens! Walgreens has Zest Fruitboost Shower Gels on sale for $2.99! Combine sale with coupons, Everyday Points, and MobiSave rebate to score 10 oz tubes for $1.22 through 12/31! Here's how:Buy Zest Fruitboost Shower Gel 10 oz $2.99 Use $1 Zest Fruitboost Shower Gel coupon Pay $1.99, Get 20 Everyday … [Read more...] about Zest Fruitboost Shower Gel Only $1.22 At Walgreens! Oral-B Manual Toothbrushes Only $.46 At Walgreens! There is a great new $2/2 Oral-B Adult Manual Toothbrushes coupon available to print! Plus, starting 12/25, Walgreens will be offering $6 Register Rewards for purchasing four select Crest or Oral-B items priced at $2.99 each! 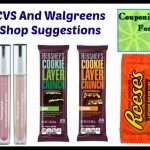 Combine coupons and RR with Everyday Points to get toothbrushes for $.46 … [Read more...] about Oral-B Manual Toothbrushes Only $.46 At Walgreens!